Does my dog need to be crate trained? The dog owning population seems to be split on this one. You have dog owners who thing no dog should ever be forced to spend time in a crate, and dog owners who see value in proper crate training. We align with the second group, when done properly crate training can be beneficial to both you as a dog owner and to your dog. When done properly most dogs actually ENJOY spending time in their crates and view the crate as a safe, den like, space. 1. Prevent destruction to your house: If you have a young puppy or a dog who does not know the difference between appropriate and inappropriate objects to chew on then a crate can save you thousands of dollars in damages to your home and belonging. The last thing you want to come home to find is a chewed up sofa or a destroyed pair of $300 shoes. 2. Make house training easier and fast: Crate training is one of the most useful tools a dog owner can have when house training a puppy. When house training the most important thing is to prevent accidents from happening in the first place. Typically we recommend our clients use the tethering system where they keep their dog on leash with them while they are home. That way they can supervise the dog and prevent accidents. 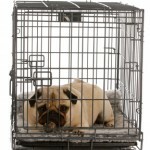 While the owner is away, sleeping, or unable to supervise the dog then crating is the best option. As long as your crate is the correct size, your dog should avoid going to the bathroom in the crate as much as possible. Dogs see the crate as their den and dogs don’t like to use the bathroom where they sleep so they will avoid going to the bathroom in the crate as much as possible. 3. Reduce separation anxiety: Some dogs get overly anxious when their owners leave the house which can lead to destruction, excess barking, harm to your dog and accidents. By teaching your dog to love his/her crate then you’re able to give your dog a safe and calm place to be while you’re gone. Your dog will be much less anxious while you’re gone and will be less likely to hurt him/herself or cause destruction to your house. If you need help with crate training your dog or addressing more serious issue like separation anxiety click below to view our training programs and to set up an evaluation with us.